Derawan Archipelago is a renowned vacation destination in East Kalimantan Province. It belongs to Berau District, actually. In order to reach the islands, tourists often take a boat from Tanjung Batu Port. Many tourists even say it is a prime checkpoint prior to visiting any islands in Derawan. Apart from that, it is famous for its local culture and attractions. Moreover, its local foods are mouthwatering! With these facts, tourists can choose it as their vacation spot prior to visiting Derawan Islands. On top of that, the location is quite accessible. 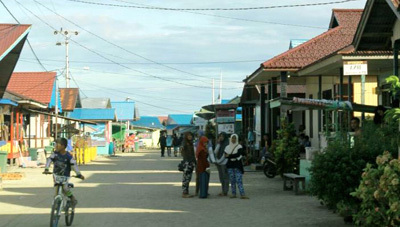 Tanjung Batu Village resides near to a coastal area. No wonder, some villagers build their house near to the beach and work as a fisherman. For tourists, such traditional settlement is quite interesting, especially for those who love photography. They can stand on the pier and capture beautiful pictures from there, including the sunset, fishermen’s activities, etc. Tanjung Batu is also famous for its ports, on which travelers can use to access Derawan Islands. It becomes a primary checkpoint to explore the archipelago, after all. That means many speedboats and local boats are seen in that location too. Before exploring Tanjung Batu Village, tourists should take a rest in a local hotel and try its delicious local crab with soy sauce. The fact is many villagers are into culinary business. Have no worries. The price is affordable and the choice of foods is many. Apart from foods, they can buy some souvenirs like clothes and crafts. Here is the thing. They must learn how to bargain in order to get good prices. As an alternative, they should ask their tour guide to buy those items on their behalf. The next adventure is on the beach! Nothing can compare the beauty of sunset in Tanjung Batu Beach. In the afternoon, the nuance is festive as local boys come to the beach and play sepak takraw (kick volleyball). Tourists can even join the game, as long as they get permission first. Apart from such activity, local people also come to the beach for gathering and singing. They spend wonderful times with either friends or families there. It doesn’t have to be a group activity, though. Tourists can come to the beach alone and enjoy its peaceful atmosphere. Tanjung Batu Village is famous for its marine activity. For tourists, they have an opportunity to ride fishermen’s boat and explore the sea. One thing, they must get the permission first. Some villagers are friendly, after all. That means obtaining such permission won’t be a difficult task. Apart from boat riding, fishing is also recommended. It is because big fishes live in that coastal area. When it is about the fishing rod and other equipment, they can either buy or rent them. From Balikpapan, tourists can take a local transportation service to Berau District. The trip takes about 18 hours and the distance is 749 km. As an alternative, they can simply take an airplane to Berau District (Kalimarau Airport). From there, the last destination is Tanjung Batu Village, which takes about 7 hours. It can be faster if they take Ahmad Yani Street.